MAY YOU LIVE TO SEE THE SKY..
…shouts a poster in the dystopian future setting of Stone Rider, the first in a new series of books by David Hofmeyr. Kane, a boy who lost everything joins a brutal race to win the chance to escape his dying world. The Hunger Game meets The Road in a vivid and powerful YA trilogy. 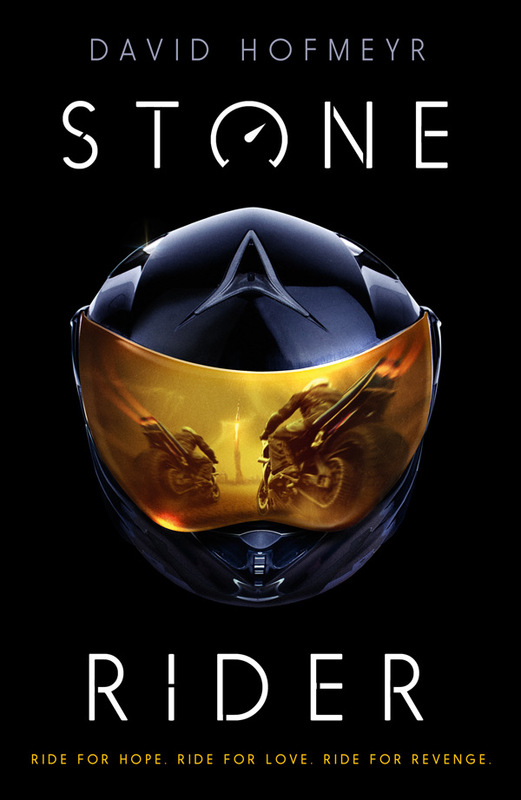 The book is based on a race, the Blackwater Trail, in which riders of futuristic motorcycles risk their lives to win place on SkyBase, high above the desperation on a resource-starved earth. Our brief was to come up with a stunning new author brand that would compete with The Maze Runner and Charlie Higson’s Enemy series. With the help of some stunning concept art by Lee Gibbons of Tin Moon, we visualised the helmet of a rider in the race, his visor showing his competitors racing for the chance to flee the earth to paradise. Our work went down a storm with Puffin, but a decision was made to go with the US cover for international brand consistency. We were disappointed, mainly because our cover was frankly better, but what a joy to do, and what a book to read. We thoroughly recommend buying a copy, or waiting for the movie to come out which is already in development.